Mr Sindikubwabo holds a Bachelor's degree in Environmental Management from Kampala International University. He has worked several years (since 1992) with Nyungwe Forest Conservation Project/Wildlife Conservation Society as Research Assistant and joined ARCOS in August 2011. 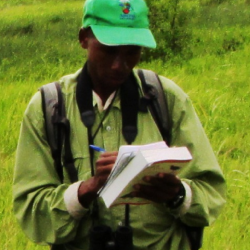 He participated in several researches, biodiversity surveys and monitoring on birds, mammals, plants, reptiles and amphibians in different important Biodiversity Areas in Rwanda, Uganda, Burundi, and Democratic Republic of Congo. He attended a number of national, international workshops related to biodiversity monitoring and action plans for conservation of Globally Threatened Birds in Africa. His overall responsibility as ARCOS’ Biodiversity Monitoring Officer is to provide the technical support to ARCOS field activities, especially in biodiversity monitoring, compilation of data and case studies on Biodiversity in the Albertine Rift region and beyond. Martin is married with five kids. He loves dealing with environmental issues and his interest lies in environmental education, advocacy and sustainable development.